The RP Photonics Buyer's Guide contains 56 suppliers for laser diodes. Ask RP Photonics for advice on various aspects of laser diodes and their use e.g. for pumping solid-state lasers. Laser diodes are electrically pumped semiconductor lasers in which the gain is generated by an electrical current flowing through a p–n junction or (more frequently) a p–i–n structure. In such a heterostructure, electrons and holes can recombine, releasing the energy portions as photons. This process can be spontaneous, but can also be stimulated by incident photons, in effect leading to optical amplification, and with optical feedback in a laser resonator to laser oscillation. The article on semiconductor lasers describes more in detail how the laser amplification process in a semiconductor works. Diode lasers are lasers based on one or several laser diodes. Most semiconductor lasers are based on laser diodes, but there are also some types of semiconductor lasers not requiring a diode structure and thus not belong to the category of diode lasers. In particular, there are quantum cascade lasers and optically pumped semiconductor lasers. The latter can be made of undoped semiconductor materials which cannot conduct significant electrical currents. Figure 1: Schematic setup of an edge-emitting low-power laser diode. The waveguide and the output beam emerging at one edge of the wafer die are shown, but not the electrode structures. Most laser diodes (LDs) are built as edge-emitting lasers, where the laser resonator is formed by coated or uncoated end facets (cleaved edges) of the semiconductor wafer. They are often based on a double heterostructure, which restricts the generated carriers to a narrow region and at the same time serves as a waveguide for the optical field (double confinement). The current flow is restricted to the same region, sometimes using isolating barriers. Such arrangements lead to a relatively low threshold pump power and high efficiency. The active region is usually quite thin – often so thin that it acts as a quantum well. In some cases, quantum dots are used. Some modern kinds of LDs are of the surface-emitting type (see below), where the emission direction is perpendicular to the wafer surface, and the gain is provided by multiple quantum wells. Small edge-emitting LDs generate between a few milliwatts and up to roughly half a watt of output power in a beam with high beam quality. The output may be emitted into free space or coupled into a single-mode fiber. Such lasers can be designed to be either index guiding (with a waveguide structure guiding the laser light within the LD) or gain guiding (where the beam profile is kept narrow via preferential amplification on the beam axis). 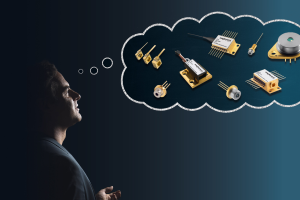 Small LDs made as distributed feedback lasers (DFB lasers) or distributed Bragg reflector lasers (DBR lasers) with short resonators can achieve single-frequency operation, sometimes combined with wavelength tunability. External cavity diode lasers contain a laser diode as the gain medium of a longer laser resonator, completed with additional optical elements such as laser mirrors or a diffraction grating. They are often wavelength-tunable and exhibit a small emission linewidth. Broad area laser diodes (also often called broad stripe laser diodes, wide stripe lasers, or high brightness diode lasers) generate up to a few watts of output power. The beam quality is significantly poorer than that of lower-power LDs, but better than that of diode bars (see below). Tapered broad-area lasers can exhibit an improved beam quality and brightness. Slab-coupled optical waveguide lasers (SCOWLs), containing a multi-quantum well gain region in a relatively large waveguide, can generate a watt-level output in a diffraction-limited beam with a nearly circular profile. High-power diode bars contain an array of broad-area emitters, generating tens of watts with poor beam quality. Despite the higher power, the brightness is lower than that of a broad area LD. High-power stacked diode bars (→ diode stacks) are stacks of multiple diode bars for the generation of extremely high powers of hundreds or thousands of watts. Monolithic surface-emitting semiconductor lasers (VCSELs) typically generate a few milliwatts with high beam quality. There are also external-cavity versions of such lasers (VECSELs) which can generate much higher powers with still excellent beam quality. Laser diodes may emit a beam into free space, but many LDs are also available in fiber-coupled form. The latter makes it particularly convenient to use them, e.g., as pump sources for fiber lasers and fiber amplifiers. The emission wavelength of a laser diode is essentially determined by the bandgap of the laser-active semiconductor material: the photon energy is close to the bandgap energy. In quantum well lasers, there is also some influence of the quantum well thickness. A variety of semiconductor materials makes it possible to cover wide spectral regions. In particular, there are many ternary and quaternary semiconductor compounds, where the bandgap energy can be adjusted in a wide range simply by varying the composition details. For example, an increased aluminum content (increased x) in AlxGa1−xAs causes an increase in the bandgap energy and thus a shorter emission wavelength. Table 1 gives an overview on typical material systems. Table 1: Emission wavelengths of various common types of laser diodes. Note that there some laser diodes operating outside the spectral regions given in the table. For example, InGaN lasers may be optimized for longer emission wavelengths, reaching the green spectral region, although typically with lower performance. Besides, there are e.g. lead salt diodes for generating mid infrared light. Most laser diodes emit in the near-infrared spectral region, but others can emit visible (particularly red or blue) light or mid-infrared light. Most LDs emit a beam with an optical bandwidth of a few nanometers. This bandwidth results from the simultaneous oscillation of multiple longitudinal (and possibly transverse) resonator modes (multimode laser diodes). Some other kinds of LDs, particularly distributed feedback lasers, operate on a single resonator mode (→ single-frequency operation), so that the emission bandwidth is much narrower, typically with a linewidth in the megahertz region. Further linewidth narrowing is possible with external cavities and particularly with narrowband optical feedback from a reference cavity (→ stabilization of lasers). The emission wavelength (center of the optical spectrum) of multimode LDs is usually temperature sensitive, typically with an increase of ≈ 0.3 nm per 1 K temperature rise, resulting from the temperature dependence of the gain maximum. (The temperature influences the thermal population distributions in the valence and conduction band.) For that reason, the junction temperature of LDs for diode pumping of solid-state bulk lasers has to be stabilized, if the absorption bandwidth of the laser crystal is narrow (e.g. only a few nanometers wide). It is also possible to tune the emission wavelength via the junction temperature. Single-mode diodes can have a significantly smaller temperature coefficient of the emission wavelength, as the resonance frequencies react less to temperature changes than the optical gain does. For applications in scanning laser absorption spectroscopy, the wavelength is sometimes scanned by operating the laser intermittently. The temperature then rises during each current pulse and causes the optical frequency to fall. The wavelength of external-cavity lasers can also be tuned, e.g. by rotating the diffraction grating in the laser cavity. Laser diodes have voltage–current characteristics like other diodes. A substantial current flows only above for certain critical voltage, which depends on the used material system. (The critical voltage is roughly proportional to the bandgap energy of the material and also depends somewhat on the device temperature.) Above the critical voltage, the current rises rapidly with increasing voltage. 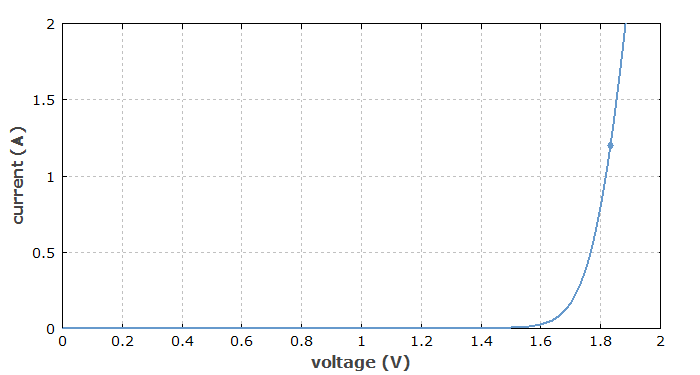 Figure 2: Current vs. applied voltage for an 808-nm laser diode. For a current of 1.2 A, as needed for the nominal output power of 1 W, the required voltage is roughly 1.8 V. (For comparison, the photon energy for 808 nm is 1.53 eV.) Note that this curve is shifted to the right for increasing device temperature; one then obtains a higher current for the same voltage. 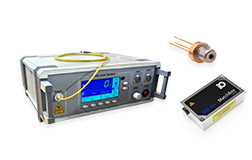 A laser diodes is normally not operated by applying a fixed voltage, because the flowing current could then very sensitively depend on that voltage, and could also be substantially affected by the device temperature. There could even be a catastrophic runaway effect: a high current could lead to a strong temperature rise, which could further increase the current, finally destroying the diode. Therefore, in practice one usually uses a laser diode driver which stabilizes a certain current; this means that it automatically adjusts the voltage such that the desired current is obtained. Alternatively, one uses a constant power mode, where the drive current is automatically adjusted for achieving the desired output power. Note that the current rather than the voltage determines the rate with which carriers are injected into the laser diode. Therefore, there is a strong relation between the flowing current and the emitted optical power. There is essentially no output power below a certain threshold current, and above the laser threshold the output power grows roughly in proportion to the current minus the threshold current. 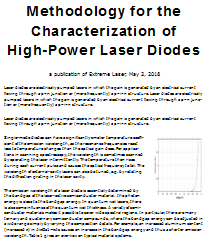 Diode lasers can reach high electrical-to-optical efficiencies – typically of the order of 50%, sometimes even above 60%. (There are development programs on the way to push efficiencies of high-power laser diodes above 70%.) The efficiency is usually limited by factors such as the electrical resistance, carrier leakage, scattering, absorption (particularly in doped regions), and spontaneous emission. Particularly high efficiencies are achieved with laser diodes emitting e.g. around 940–980 nm (as used e.g. for pumping ytterbium-doped high-power fiber devices), whereas 808-nm diodes are somewhat less efficient. The highest power conversion efficiency is typically achieved not for the highest output power, but for a somewhat reduced output power, because the required voltage is then lower. Some low-power LDs can emit beams with relatively high beam quality (even though the high beam divergence requires some care to preserve that during collimation). Most higher-power LDs, however, exhibit a relatively poor beam quality, combined with other non-favorable properties, such as a large beam divergence, high asymmetry of beam radius and beam quality between two perpendicular directions, and astigmatism. It is not always trivial to find the best design for beam shaping optics, being compact, easy to manufacture and align, preserving the beam quality and avoiding interference fringes, removing astigmatism, having low losses, etc. Typical parts of such diode laser beam shaping optics are collimating lenses (spherical or cylindrical), apertures and anamorphic prism pairs. As the light emitted by a laser diode is linearly polarized, it is possible to combine the outputs of two diodes with a polarizing beam splitter, so that an unpolarized beam with twice the power of a single diode but the same beam quality can be obtained (polarization multiplexing). Alternatively, it is possible to combine the beams of LDs with slightly different wavelengths using dichroic mirrors (→ spectral beam combining). More systematic approaches of beam combining allow combining a larger numbers of emitters with a good output beam quality. Although the most common mode of operation of LDs is continuous-wave operation, many LDs can also generate optical pulses. In most cases, the principle of pulse generation is gain switching, i.e. modulating the optical gain by switching the pump current. Small diodes can also be mode-locked for generating picosecond or even femtosecond pulses. Mode-locked laser diodes can be external-cavity devices or monolithic, in the latter cases often containing different sections operated with different current. Different types of diodes have very different noise properties. The intensity noise is typically close to quantum-limited only well above the relaxation oscillation frequency, which is very high (often several gigahertz). However, some low-power LDs operated at cryogenic temperatures have been demonstrated to exhibit even significant amplitude squeezing, i.e., intensity noise well below the shot noise limit. In all semiconductor lasers, intensity noise is generally coupled to phase noise, making these noise properties strongly correlated. As mentioned above, linewidth values are very different. Multimode LDs exhibit a lot of excess noise associated with mode hops. Noise in different modes can be strongly anti-correlated, so that the intensity noise in single modes can be much stronger than the noise of the combined power. This has the important consequence that the intensity noise can be increased when the beam e.g. of a diode bar is truncated at an aperture or spectrally filtered. The diode driver can also contribute a lot to the laser noise, because even very fast current fluctuations can be transformed into intensity and phase fluctuations of the generated light. When operated under proper conditions, diode lasers can be very reliable during lifetimes of tens of thousands of hours. However, much shorter lifetimes can result from a number of factors, such as operation at too high temperatures (e.g. caused by insufficient cooling) and current or voltage spikes, e.g. from electrostatic discharge or ill-designed laser drivers. There are different failure modes, including catastrophic optical damage (COD) (with complete device destruction within milliseconds or less) and steady degradation. Apart from the operation conditions, various design factors strongly influence the lifetime. For example, designs with aluminum-free active regions have been found to have superior reliability and lifetimes, and certain coatings (or just additional semiconductor layers) on optical surface can also be very helpful. The details of some advanced diode designs have not been disclosed by manufacturers in order to maintain a competitive advantage. In order to improve device lifetimes, LDs are often operated at reduced current levels (and thus output powers). Moderate power reductions can at the same time increase the wall-plug efficiency due to the lower junction voltage, whereas stronger reductions reduce the efficiency. Low-power single-mode LDs with high beam quality are used for data recording and reading on CD-ROMs, DVDs, Blu-ray Discs, and holographic data storage media. Such lasers can operate in different spectral domains from the infrared to the blue and violet region, with the shorter wavelengths allowing for higher recording densities. Single-mode LDs are widely used in optical fiber communications, particularly in data transmitters. In some cases, the data modulation is done directly via the drive current. Single-mode LDs are also applied in laser spectroscopy (TDLAS) with very compact low-power measurement devices. Small red laser diodes (→ red lasers) are used as laser pointers. Distance measurements are often done with modulated low-power diode lasers. Similar lasers are used in laser printers, scanners and bar code readers. Broad area laser diodes, diode bars and diode stacks are often used for diode pumping of solid-state lasers. Fiber-coupled broad area LDs also serve as pump sources of fiber amplifiers. Some kinds of surgery (e.g. treatment of enlarged prostates) and dermatological therapies can be done with radiation from diode bars. High-power diode stacks are directly used in material processing in cases where a high beam quality is not required, e.g. for surface hardening, welding and soldering. Compared with other high-power lasers, they are simpler and have a much better wall-plug efficiency. In terms of sales volumes, the applications in optical data storage and telecommunications are very dominating. The third most important application, which is pumping of solid-state lasers, already has sales volumes which are nearly an order of magnitude lower than the previously mentioned sectors. Low-power laser diodes generate the largest revenues of all laser types – mainly due to applications in communications and data storage. 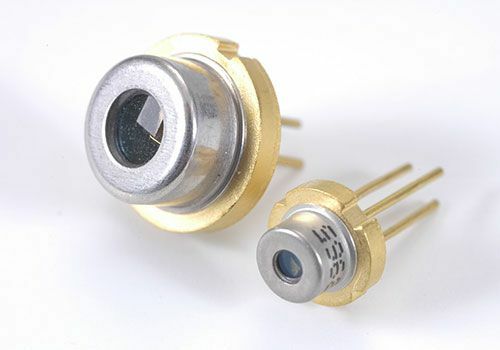 High-power laser diodes have far lower sales numbers and volumes, and are used mainly for displays (with fast growth), medical and military applications. Direct use of high-power laser diodes for material processing his a small volume so far, but exhibits rapid growth. LDs are often used in the form of laser diode modules, containing a variety of additional components e.g. for beam shaping and cooling and protection of the LD, and wavelength conversion. A semiconductor optical amplifier (SOA) has a setup which is similar to an LD, but the end reflections are suppressed. Without an input signal, such a device can act as a superluminescent diode (SLD), generating light via amplified spontaneous emission. The optical spectrum is then smooth and normally much broader. Light-emitting diodes (LEDs) use the same mechanism of generating photons as LDs, but they usually do not exhibit significant optical amplification (laser gain). So-called resonant-cavity LEDs do exploit some degree of stimulated emission, and are in this sense intermediate between ordinary LEDs and SLDs.